We are accepting award applications until 9th December! The free e-learning module on pancreatic cancer –click here. Raised awareness of pancreatic cancer within your pharmacy and the wider community – you can hand out information or use social media to spread the word! To submit your entry, complete our Pharmacy Award application form. 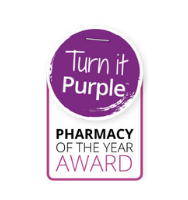 The deadline for Pharmacy of the Year award is 9th December. The form will ask for details on your pharmacy, the staff that completed the e-learning module and information on the awareness activities you carried out in November. As an optional extra, you can also upload images to support your application. Don’t forget to let us know everything you’ve been doing! A profile on your pharmacy in Pancreatic Cancer Action’s Action Magazine and Turn it Purple toolkit 2019. We will be announcing the winner of the Pharmacy of the Year Award 2018 mid December, so keep a look out on our website and social media pages. You can also sign up to our e-newsletter for healthcare professionals. Every pharmacy that enters will receive a certificate to display in their pharmacy.